We have a brand new sketch for you today at Let's Get Sketchy! I was so excited to work on this sketch because it is a perfect layout design to use with CTMH's new Honeycomb stamp set. This was the first set I ordered out of the new Spring/Summer Idea Book and I absolutely love it. 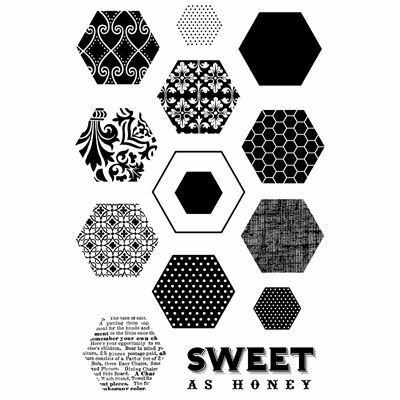 I stamped the hexagon shapes using the Honeycomb stamp set and the title "Sweet as Honey" is also from that stamp set. (Hexagons were stamped in Cranberry, Hollyhock and Blush inks and the outline was stamped in Outdoor Denim ink). The flower cluster is fussy cut from the new Claire collection of papers. I cut out multiples of each flower and added layers to the flowers using foam tape. The banner in the top right is also from the Claire paper collection. The stamped flowers around the title are from the stamp set that comes exclusively with the Claire Workshop kit (stamped in Hollyhock ink). The tag is from the Canvas Shapes self adhesive embellishments - I simply hole-punched a spot to thread my ribbon through. I stamped the name in Outdoor Denim ink using the retired Tiny Type alphabet stamp set. I embellished using some retired Outdoor Denim twill ribbon and some pearls from the Mocha Opaques Adhesive Gems. 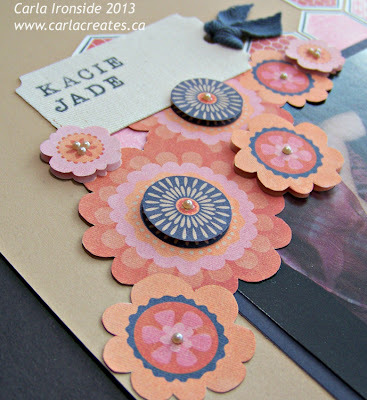 Cardstock colours used were Outdoor Denim and Cashmere. Hexagons were cut using the Accent Essentials Cricut cartridge at 1.25" on Colonial White cardstock. I do hope you'll join us this week at Let's Get Sketchy! Thank you Carla. Your layout is so cute and the hexagon stamps are so cool. Awesome job Carla! Love the colors and the flowers. What a precious photo! Great colors! I love how your banner really pops. Nice work Carla!